I have been taking the pills from the Beauty Radiance set for close to a month already. If you have not read my introduction on AFC & why collagen supplements will aid you with your anti-aging regime. Do check out my previous BLOG POST here. In conjunction with their 40th anniversary promos, they have packed the collagen supplement into this limited edition set. 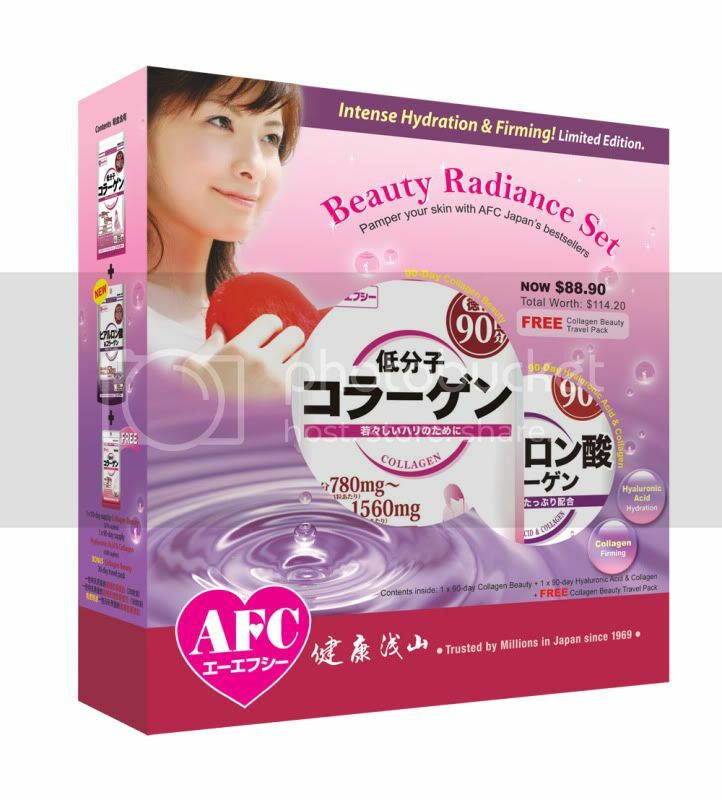 As previously mentioned in my earlier blog entry, usual price for the AFC Beauty Radiance Set is S$114.20 but with AFC Japan's 40th anniversary promotion, it is now available at a special price of just S$88.90. Which I find really worth it and a few of my friends have bought the Beauty Radiance set after reading my blog entry. As a lady in her mid-twenties, starting on anti-aging is not far from my mind. We all start to age the moment we hit 20-21 years old and prevention is better than cure. Once the wrinkles and other ugly aging signs start to set in, there is nothing much you can do about it. Why splurge thousands on botox or other cosmetic surgery procedures when you can try to delay it now? I must admit that I have not been taking good care of my skin. On some nights when I am so tired out, I just go to bed after cleansing my face. Yes, *guilty-look*, I do not follow up with toning & moisturizing, which is really bad :( However, I do remember to take my supplements as it's so simple. Just open your mouth and pop the pills in, gulp down a mouthful of water and you're done. Of course, it is also recommended that you eat the supplements around 10PM and then go to bed immediately. As the skin rejuvenates from 10PM to 2AM, so if you keep missing these precious hours of sleep. You are definitely NOT getting your beauty sleep at all! I think that so far, my skin is still doing fine despite all that I have and not have been doing to maintain it. So it must be the collagen & hyaluronic acid supplements at work! My pimples are kept at bay, oil control has been pretty good and makeup goes on well. Taking these supplements makes battling anti-aging almost effortless and hassle-free. Besides that, the packaging makes it so convenient to bring out. 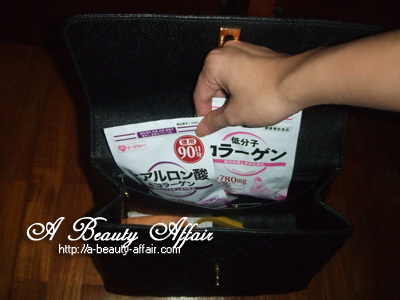 A bottle is too bulky to luge around in your handbag but these mini zip-lock packs are handy enough to bring along even if you are going overseas. You need not worry about having to transferring them into a pillbox (read: BULKY). The size of the pills are also small enough, it makes it so easy to swallow in comparison to the previous brand I was taking. I had a difficult time swallowing them and the taste was pretty awful if I were to chew on it. 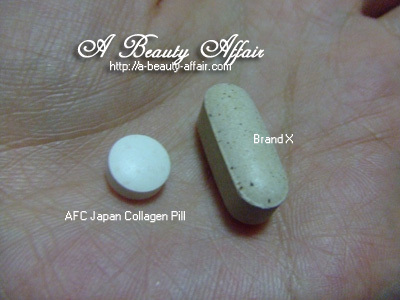 However, AFC Japan's collagen pills did not leave a bitter after-taste at all. I'm loving my AFC Japan pills! 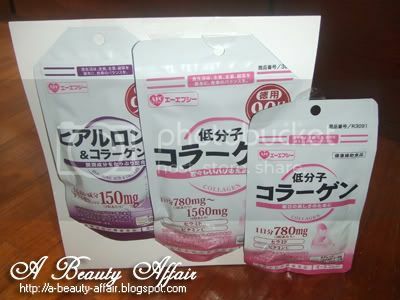 your very own pack of AFC Japan Collagen too!!! 3) TAG YOURSELF on the AFC Japan 90 Day Collagen Beauty Pack photo and click SHARE to post it on your profile wall! Contest ends 10th Oct 2010 Midnight & results announced by 15th Oct 2010! Contest CLOSED in advance!! Thanks for the response :) Winners will be announced soon. Sorry about the inconvenience caused! AFC Japan collagen supplements can be found at UNITY HEALTHCARE outlets. Hi ara, I guess there must be some technical issues. How bout you just leave a comment on why you wanna win it? I will be changing the rules to this giveaway then :) Thanks! Do also remember to share the photo on your profile! Please ignore my previous comments. I just realised that I did not allow tagging in the photo, just allowed it in the settings. So now, you may proceed to TAG yourself. I'm sorry for the boohoo. Thanks alot! Hi Clevergirl, how come you don't like the M brand? I find it a hassle to have to mix it into drinks so I prefer those in pill form. when comes to beauty, it is never too early to start taking good care and I wonder how collagen can help me to maintain and defy aging..